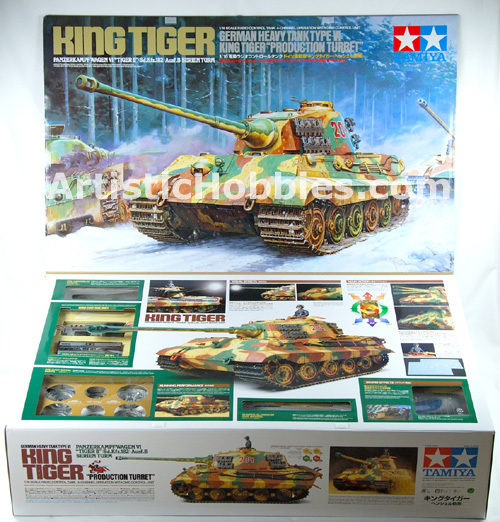 In this tutorial, we will teach you how to build and paint your Tamiya 1/16 Full Option King Tiger model kit. Before we get started I just want to tell everyone that this project can be quite challenging especially if you’re a beginner in modeling. But with that said, it should not discourage you from trying. As long as you follow the detailed instructions included with the model, you will be fine building this model. Since this is our first Tamiya 1/16 Full Option tutorial build. This project will take some time to finish, which means we will update this page as we go along. So you will have to come back from time to time to see if new updates are available on this tutorial. We want to include as much information on this build as possible to help models understand what's involved in this build especial if you’re new to modeling or your just thinking about tackling this project for the first time. One of the first things you notice right from the beginning is the size of the box. At 29”x18”x6” and weighing in at almost 14 lbs, It’s a big boy to say the least. Most of the weight is do to all the metal parts and electronics that come with this model. When you open the box, you will notice how well packaged everything is. Each component is individually boxed securely in one larger box shown below. 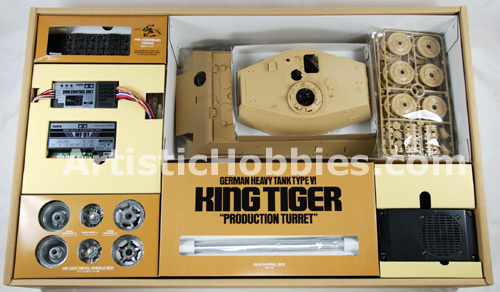 Also included in your model kit will be a parts list, build manual and a camouflage reference sheet with some great pictures of a real King Tiger. The build manual is written in both English and Japanese and is very detailed on how to build this model. 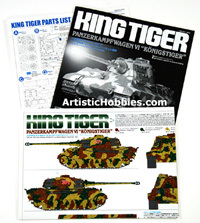 Also included in the build manual is information on the history of the King Tiger and some great black and white photo’s. The camouflage reference sheet includes 4 different paint schemes with the history behind each one. But you can also paint your tank a solid color if you want, like a tan or gray color. The choice is up to you! The one thing I highly recommend before assembly of your model is to read over the entire build manual first. This will help you in knowing what tools and paint is required for your model build. Good planning makes for a good model build.